Here’s an old standby that never fails to please — a savory spread based on creamy white beans, accentuated with sun-dried tomatoes. Serve with raw vegetables and crispbreads. 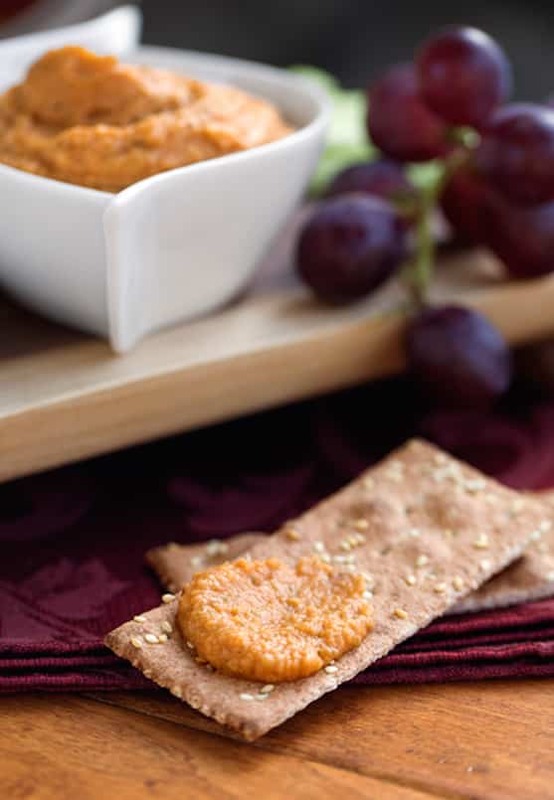 Make the sliceable version of Smoky Cheddar Cheez and serve with crisp red grapes for a lovely array of appetizers. Photos by Hannah Kaminsky. Here's a savory spread based on creamy white beans, accentuated with sun-dried tomatoes. Serve with raw vegetables and crispbreads. Heat the oil in a skillet. Add the onion and sauté over moderate heat until translucent. Add the garlic and continue to sauté until the onion is just beginning to brown. Combine the onion mixture with all the remaining ingredients except the salt and pepper in the container of a food processor and process until completely smooth. Drizzle in 2 tablespoons of water or so, to loosen the consistency. Stop and scrape down the sides as needed. Season with salt and pepper. Pat into an attractive shallow crock to serve. 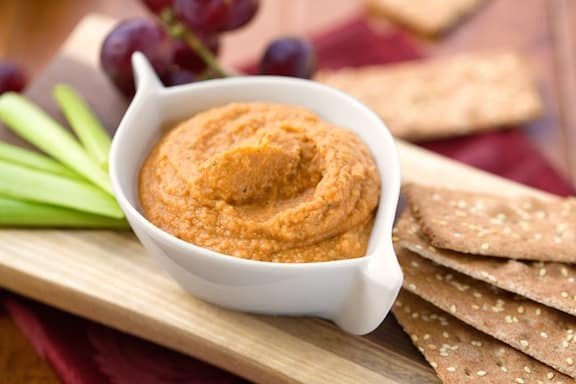 Place on a large platter and surround with whole-grain crackers and crispbreads. Here are more vegan appetizer recipes. So easy to make, and an instant hit! This is a keeper. How cool, Shawn! Tell Gail I said hello, and I’m glad you all enjoyed the dip. I’ve been making this for about a year and I figured it was time to rave about it! This is so delicious and easy that I make it every time I’m invited anywhere and need to bring something. 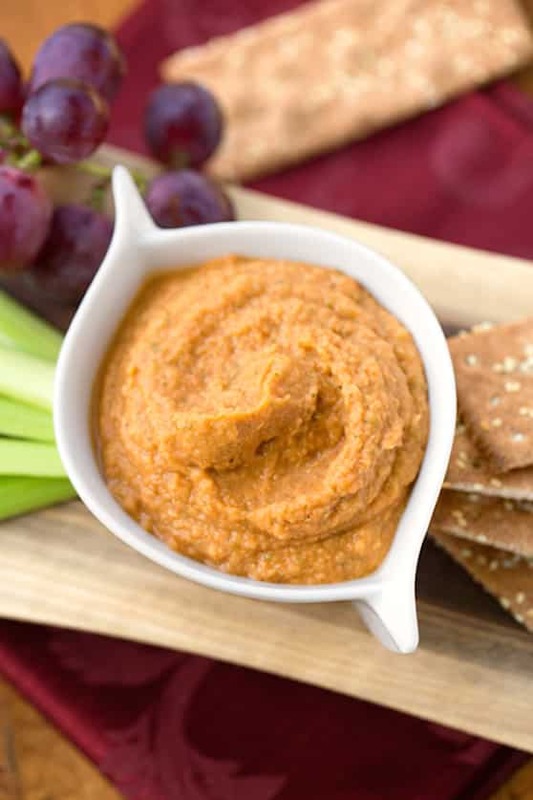 It’s so absolutely yummy and different and it’s always a hit. It’s my go-to dish and I just finished making it to bring to a baby shower in a couple hours….yum! Hey Janelle, I’m so glad you enjoy this! It has been a while since I made it myself, but I’m looking forward to bringing it back to the top of the rotation for the holidays. Thanks for your comment. Love this recipe from when I first saw it in Celebrations! I tried to see the tofu “egg salad” recipe on the website and can’t get to it.. I tried in two browsers. Hi Ruth, so glad you found me! And for the heads up that the link to the “egg” salad link isn’t working; it should be good now: http://www.vegkitchen.com/recipes/tofu-eggless-egg-salad/ — if you see this response, pls let me know if you still can’t access it.